This module provides a blog based on ZF2 and Doctrine2. Posts are rendered by a markdown parser. Posts are taggable and searchable. Post listing is provided, same is true for tags. Hyperlinks to dedicated posts are secured by encrypted identities. Hyperlinks also ends with slugified post titles to meet SEO. This module is based on DoctrineORMModule and be sure that you have already configured database connection. Encryption is supported by hashids/hashids and have to be configured by copy ./vendor/mamuz-blog/config/crypt.local.php.dist to ./config/autoload/crypt.local.php. Be sure that this file is not under version control. The only thing you have to do is changing salt value to any complex string. 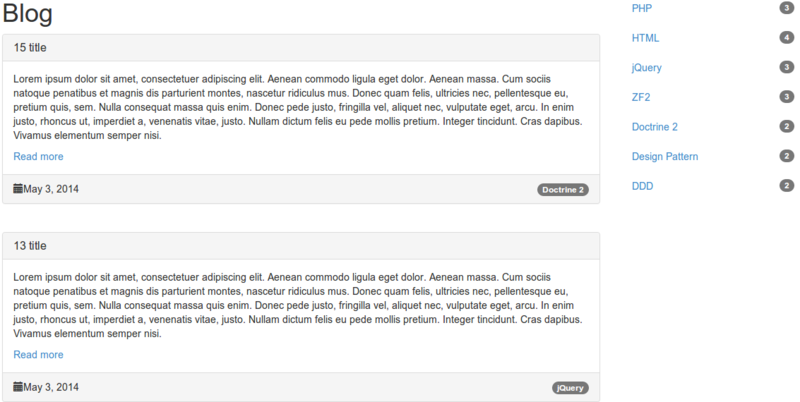 Listings of posts and tags includes a pagination feature, which seperates views to a default range. Default range is overwritable by adding a config file in ./config/autoload directory. Post listing is provided by route blogPublishedPosts and default range is two items. Tag listing is provided by route blogTags and default range is 10 items. Create an entity in MamuzBlogPost repository and tag it in related MamuzBlogTag. Admin Module to provide an interface for that is planned. If routing to a dedicated post found by published flag and encrypted identity is successful, post content will be responsed in a new view model rendered as markdown, otherwise it will set a 404 status code to the http response object. For the sake of simplicity Event is used for FQN MamuzBlog\EventManager\Event. Posts: Published articles about any issues which are listed chronological in a blog. Tag: Category to group related posts to a specific issue. Permalink: Human-readable and unchangeable hyperlink to a dedicated post or to a list of posts by a specific tag.